With a gargantuan task ahead of it, the organizing committee for the 2020 Tokyo Summer Olympics and Paralympics says its plans for the Games will break new ground. Former Prime Minister Yoshiro Mori, 76, was tapped to head the committee, with support pledged by the nation’s most powerful business lobbies in fund-raising efforts. Its work officially kicked off Jan. 24. 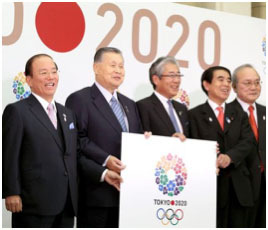 The committee, with a budget of 341.2 billion yen ($3.31 billion), will not only oversee the preparations for the Games and manage them but also lead the effort to raise funds for the event. It will be also in charge of selling tickets and coordinating with the IOC. The secretariat, with an initial task force of about 50 people, will be set up in the Tokyo metropolitan government building. The staff will eventually expand to 3,000, who will work in conjunction and coordinate 80,000 volunteers by the time the Games are finally held. Akio Toyoda, 57, president of Toyota Motor Corp., is expected to serve as Mori’s deputy, having expressed informal consent to become the vice chair. He was initially considered a leading contender to head the committee. But people associated with him said he declined the post due to opposition from his father, Shoichiro Toyoda, who is the honorary chairman of the auto giant. Toshiro Muto, 70, the chairman of Daiwa Institute of Research and a former administrative vice minister with the Finance Ministry, will head the committee’s secretariat. Muto was tapped for the post due to his extensive connections with business leaders and government officials. The organizing committee is expected to submit to the IOC a basic plan for the Olympics and Paralympics by February 2015. Its primary task for the interim though is to raise funds. Three business organizations--Keidanren (Japan Business Federation), Keizai Doyukai (Japan Association of Corporate Executives) and the Japan Chamber of Commerce and Industry--have already pledged to assist the organizing committee in fund-raising efforts. There is a notable difference in the lineup of key officials who are overseeing Tokyo’s efforts compared with previous Olympics--the absence of athletes sitting on the committee. For example, gold-medal winning runner Sebastian Coe headed the organizing committee for the 2012 London Olympics. The IOC has traditionally promoted the idea of athletes sitting on the committees as a way of mitigating the influence of politics in their decision making. But, few names in the Japanese sports circles were floated about who to head the committee due to “a lack of talent,” according to a senior official with the Japanese Olympic Committee.